Billy Corgan: "We need a lot of love right now"
Conventional wisdom would have it that Billy Corgan should be reassembling the classic lineup of The Smashing Pumpkins - James Iha, D'Arcy and Jimmy Chamberlin, along with himself - for a de rigueur 20th anniversary take-the-money-and-run tour. As it turns out, that's the furthest thing from Corgan's mind. Rather than revisit the past, the Pumpkins mainman is putting together a new version of the band (Smashing Pumpkins Mark III? ), which includes the recent hiring of 19-year-old Mike Byrne on drums (he replaces Chamberlin, who tendered his resignation last spring). Doing the unexpected also extends to the mammoth album project Corgan is involved in, a planned 44-song set to be called Teargarden By Kaleidyscope. Corgan is intent on releasing Teargarden one track at a time, as free downloads, starting in late October. "No strings attached, no e-mail address need be given, no fees, nothing, totally free," he says. "A 44-song free-for-all!" The monolithic album will also be available physically: the format will be 11 EPs with four tracks each. 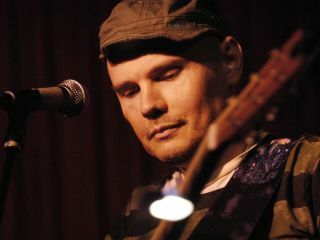 Corgan, who is working with Byrne, producer and drummer Kerry Brown and Mark Tulin on bass (the latter two haven't been specified as 'official' Smashing Pumpkins yet), sat down the other day with MusicRadar to give us an update on how everything is progressing. How would would say Mike Byrne is challenging you? Is it a kick in the pants to have somebody so young playing with you? "Mike was coming in after a lot of the songs were already written, so at this point his role is being reactive to what was already there, which he is very naturally gifted at. He is a really good groove drummer and that alone is making me see different points to emphasize in my arrangements." What kind of writing and demoing process are you following? To write and record 44 songs in a short period of time is a massive undertaking. Are some songs the result of jams? Do you have a backlog of material? "Currently we are up to 54 songs, which is overwhelming because I write them so fast I don't always remember what we did when we listen back. "I was mostly writing with the support of Kerry Brown on drums and Mark Tulin on bass. We would work together to create a strong frame of reference that would only hint at what the song 'could' be, and once found we'd move on to the next." Of the new songs you've written, what's your favorite and why? Musically, what's it like? Can you describe the feeling you have when you play this song? "I have a lot of favorites, so I guess it would be easiest to talk about one I am finishing right now called A Stitch In Time. I wrote it sitting around backstage on one of the SP tours in 2008, and it is pretty simple in that the whole song is built around a very driving acoustic guitar, with no drums or bass. "When we were playing the song on the Spirits tour, it was just acoustic plus mandolin and violin, which I really liked because of its bluegrass vibe. "In the studio it's totally changed and now sounds like some kind of gothic Indian orchestra is playing the song with the same original guitar part. I'm pretty surprised by how it has turned out to be so psychedelic - I didn't expect that but guess it is just where my head is at right now." By releasing 44 songs one at a time, or in batches, you just might qualify for some kind of Guinness Book of Records award. Where did you get this idea? "The songs will be recorded in batches of 4 to make the 11 EPs, so 11 times 4 equals 44. The number just felt right to me to tell the story I want to tell. Where my ideas come from I'll never know. Hopefully from a good source!" "There are many songs where I feel I really missed the boat on the recording or production"
What do you actually use to write and demo with? I assume you have a pretty sophisticated home setup, but while traveling, do you ever use anything like GarageBand? "I honestly have no demo setup other than maybe using a hand-held tape recorder. I am not so good at writing on the road so I don't really try, which relaxes me enough that occasionally one will just show up. I have a good memory for the basic ideas, so a lot of times I'll just work on a tangent for months." I know every song, every album, is part of a musical journey. But are there any albums that you wish you could take back? Any moments where you think, "Nah, I really didn't get it right there"? "Yes, there are many songs where I feel I really missed the boat on the recording or production. I trust my songwriting a lot as it is usually an accurate portrayal of wherever I am standing in my life at any given moment for better or worse." You're a monster guitar player. But for some reason, people don't accord you with the same reverence they do some other players. Does that bug you at all? "The only thing that has ever bothered me about the idea of credit is when credit is purposely withheld where credit is due. There are many musical pioneers who have been forgotten or overlooked, and that really saddens me for them and their families. "I personally have let go of the idea that my musical life will be seen with any real clarity by anyone anytime soon. All I can say with a smile is...I am still here." Do you have any kind of practice schedule on the guitar or any other instruments? "I rarely practice. I want to learn how to play the drums finally, and I've practicing piano more because I'm writing more complex songs and I have to be able to record them." Have you ever found a guitar that comes close to the early '70s Strat that was stolen? Is your Fender signature model a good approximation? "I wish whoever stole my original Gish Stratocaster would just give it back. When it was stolen in 1992, I offered a reward but it has never resurfaced. I am still hopeful it will come home one day. I do have one guitar from the same era that is about 90 percent as good, even the same color, but it's not that one!" "I rarely practice. I want to learn how to play the drums finally, and I've practicing piano"
So I checked out your new website, everythingfromheretothere.com, and was struck by how I lingered over it. I took my time reading the content. Was that part of the idea behind starting the site? Getting people to just slow down a little and think? "My main focus on starting a spiritual website was to help others where I could. I have no idea who is reading or why they are reading, but I do feel some of what I am saying makes a contribution peer-to-peer. "Everyone is welcome at the site regardless of their religious affiliation. I would give up a lot to help create a lasting peace for the planet, for we need a lot of LOVE right now."